Last Friday was the first Yahoo! 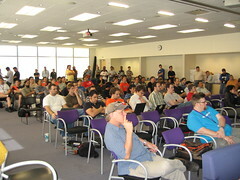 Hack Day hosted at our Sunnyvale Campus and open to anyone in the company. Previous Hack Days were either geographically limited (Bangalore, for example) or hosted primarily by a single business unit (such as "Search and Marketplace"). Because I was at the Podcast Academy (also hosted at Yahoo! last week) on Thursday, I didn't hack. Instead I got to be Chad's assistant, herding cats (I mean "hackers") into the presentation queue, assigning presentation slots, and so on. You see, when roughly 100 hackers or teams are each presenting for 90 seconds, you're looking at 2.5 hours--assuming that nobody wastes time not being prepared. In short, I had fun. We had a killer lineup of judges (Filo, Sue Decker, Stewart, Larry Tesler, Ian Rogers, etc. ), some amazing hacks, lots of energy, humor, pizza, and beer. What's not to love? For a moment I was sure that Mike Arrington was wearing a Google t-shirt (how funny of him, right?). 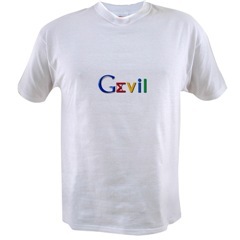 But then I got closer and realized that he also has a GEvil shirt! About an hour and a half into the presentations, he asked me how many hacks there were. I'm not quite sure what the look on his face was when I told him there were about 100. He certainly seemed satisfied by that answer. Particularly after loading up on Hack Day pizza, candy and beer. Hey Jeremy any idea where the puppetron video they showed with the puppets hacking might be found?